Dr. Weeks’ Comment: before I was trained as a medical doctor, I was a beekeeper. Have been for almost 30 years. My bees are fabulous companions and, as any beekeeper will tell you, great example of wisdom. My honey is alive. That means it is RAW (not heated in order to reduce viscosity, as commercial beekeepers do for economic reasons: so it flows into bottles faster) and therefore the digestive enzymes imparted by the working bee remain intact. (That is correct, when you think about it, honey, after all, if bee vomit! …) So I am pleased that honey is being protected from GMO contamination from the likes of Monsanto. For raw and organic honey, call 360-341-2303 and order from SafaLab. This ruling is a victory for the critics of genetic engineering: honey, which contains only small amounts of GM pollen may not be sold without additional approval – it has now decided by the ECJ. The saying is urging the EU and the agricultural lobby on the defensive. 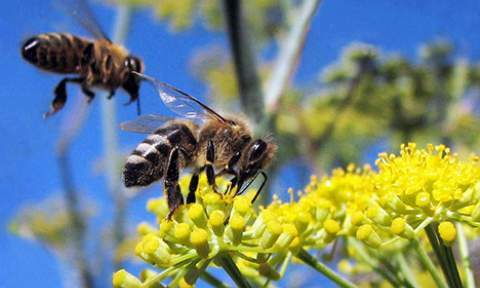 Luxembourg – The European Court of Justice (ECJ) to stop the sale of honey with traces of genetically modified maize. Honey, where are also found only a small residue of genetically modified pollen may be placed on the market only with approval. The European Court of Justice in Luxembourg ruled on Tuesday. He was thus the action brought by a beekeeper from Augsburg right. The decision may impact on the entire European market for honey and genetic engineering are mounting. For now it is time honey is contaminated with genetically modified pollen, cleared off the shelves. Especially to many import honey from Canada and South America could be true. According to a report in the journal “Ã–kotest” in January 2009 were found in nearly half of all honeys tested, then traces of pollen from genetically modified plants. The Federal Ministry of Agriculture will study the ruling and consult with the competent supervisory authorities of the countries about the consequences. This is particularly so go now, “as the guidelines of the court for trade in honey can be implemented as quickly as possible,” said a spokesman in Berlin. Moreover, the European Commission was asked to submit a proposal for a uniform approach across the EU. The nutritional and agricultural expert of the FDP in the German Bundestag, Christel Happach-Kazan, called for a revision of laws on genetically modified food.A policy of “zero tolerance” for genetically modified organisms (GMOs) is “unrealistic”. The consumer affairs spokesperson of the SPD in the Bundestag, Elvira Drobinski welcomed and white, however the verdict. It brought “clarity at last.” The environmental group BUND praised it as “groundbreaking”. The big winner of the proceedings is the beekeeper Karl-Heinz Bablok from Augsburg. He produced honey in the vicinity of a property, was grown on genetically modified maize for research purposes.Later he found in the pollen of the honey variety Monsanto 810th This corn is as animal feed but not approved as food.Bablok destroyed in an incinerator to end his honey and sued the state of Bavaria for damages. This is now available to him after the ruling of the ECJ. In addition, all farmers want to grow in the future, the genetically modified corn, expect that beekeepers claim damages in their region as well as protective measures to prevent contamination. The decision is a bitter defeat for the EU Commission and lobby groups in the agricultural industry. Because they want to weaken the principle of zero tolerance for genetically modified foods. In Germany, the cultivation of GM crops is banned since April 2009. Monsanto’s efforts, however, a re-admission. Have you seen my $700Billion? Where did it go?